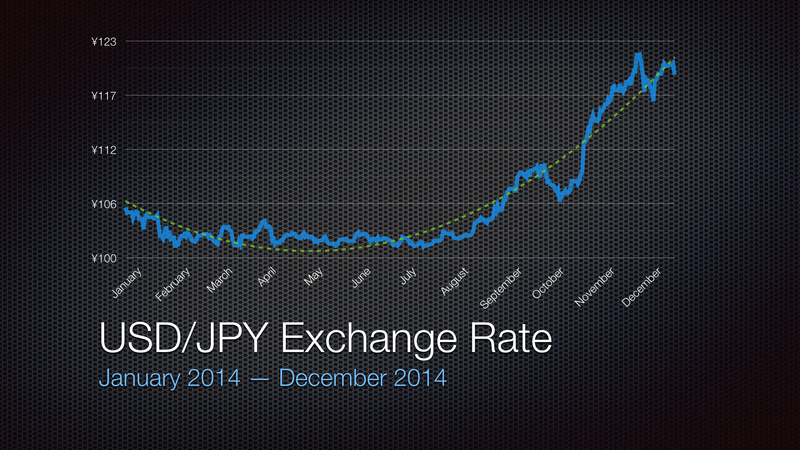 2013 saw the US dollar return to health against the Japanese yen after a good five years of depressed valuations. The dollar continued to improve in 2014 with the first half of the year looking relatively flat before making a good run in the second half. We’re sitting at about 120 yen to the dollar, currently, which is right about where we were back when I started collecting in late 2005. During the extended doldrums of 2008-2013, I honestly thought we might never make it back to this level again. I’m quite happy to be proven wrong on that count. 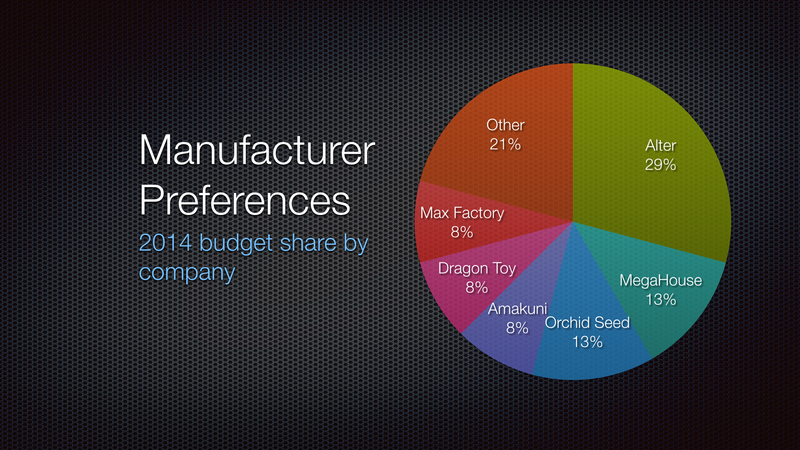 First off, let’s look at preorders that were still open at the beginning of the year and see where they ended up. As with the past few years, the 2014 budget was split into two parts: a monthly rolling allocation intended for preorders and a yearly lump sum allocation for everything else. 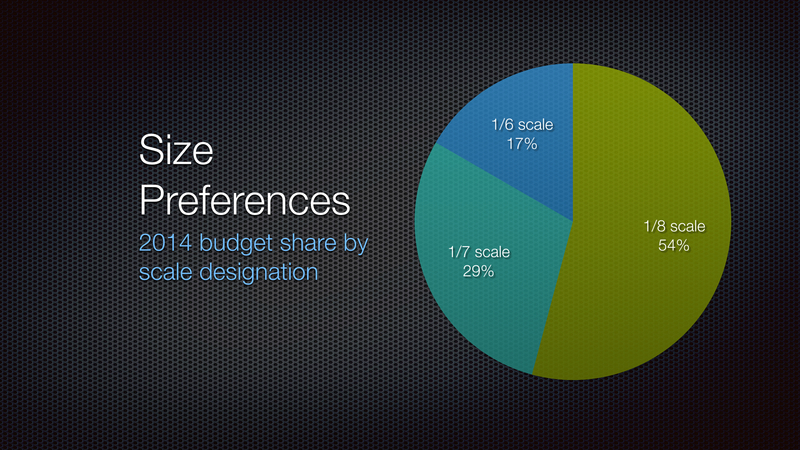 We’ll take a look at how each was utilized separately. 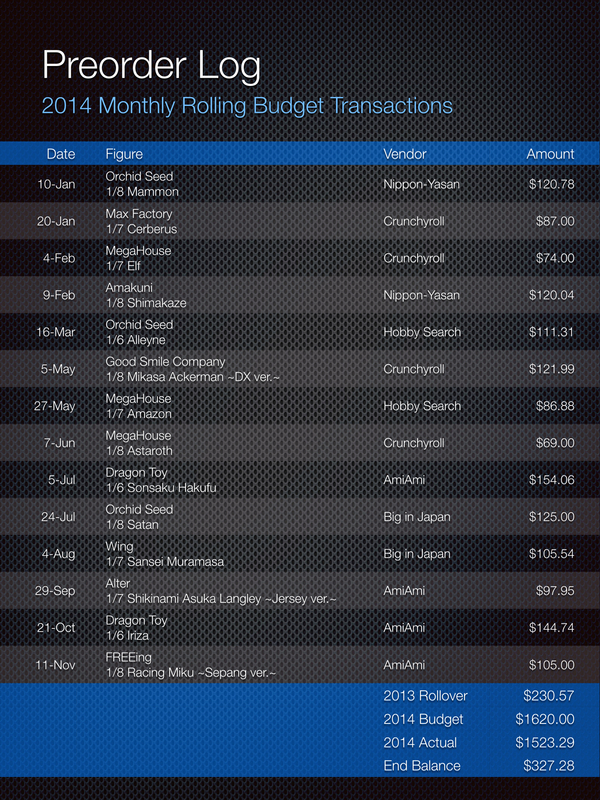 As a reminder, this year’s preorder budget consisted of a $135/month allocation and a $230.57 rollover from 2013. Here’s how it was used. And here’s the same set of transactions graphed over time. There’s not a whole lot to say here. The rolling budget structure is intended to distribute spending linearly over time and that’s pretty much exactly what we see. 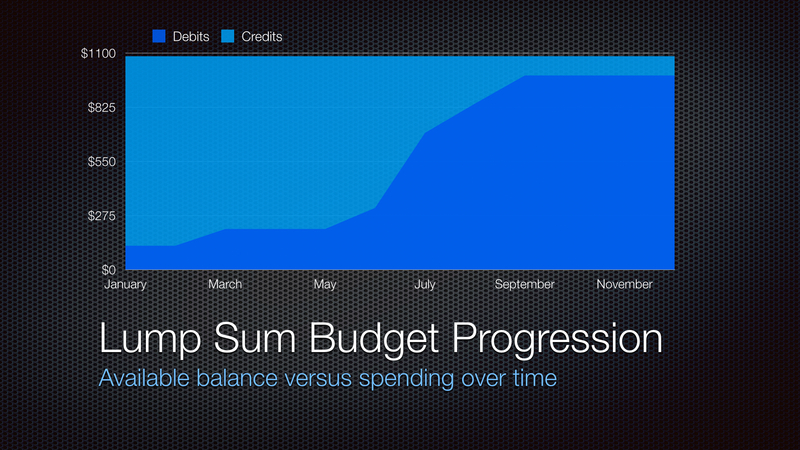 The lump sum budget consisted of a $650/year allocation and a $433.44 rollover from 2013. Here’s where it went. Now, the same data over time. First half spending was fairly restrained, but I still managed to nearly exhaust the lump sum budget by the end of the year thanks to some pricey second-hand figures that I picked up. I would have liked to sell some of the older, less-loved figures from my collection to free up some space and bolster the depleted lump sum balance, but my usual laziness kicked in and I only sold one for the entire year. 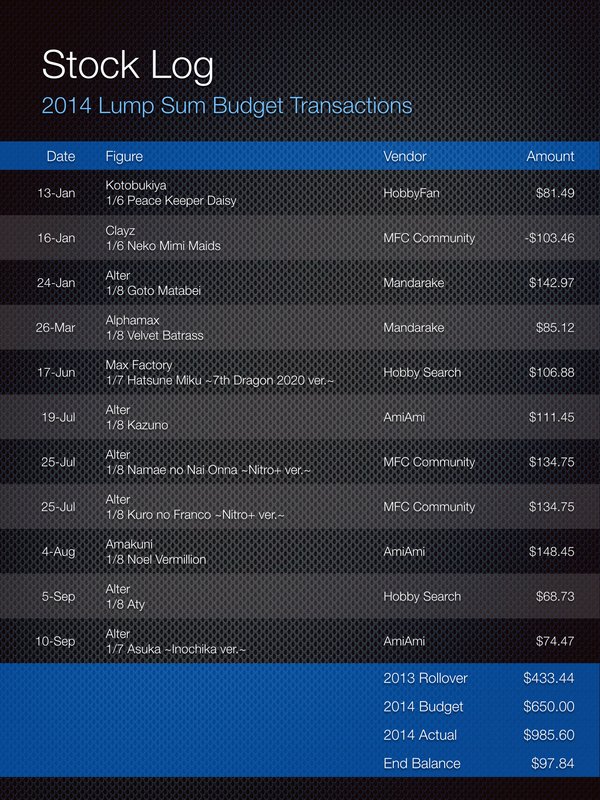 Taking both budget allocations into account, 2014 saw 24 new figures purchased, up from 22 in 2013. There were 14 normal preorders, two exclusive releases, three bargain bin pickups, six secondary market purchases, and five open preorders at the end of the year. 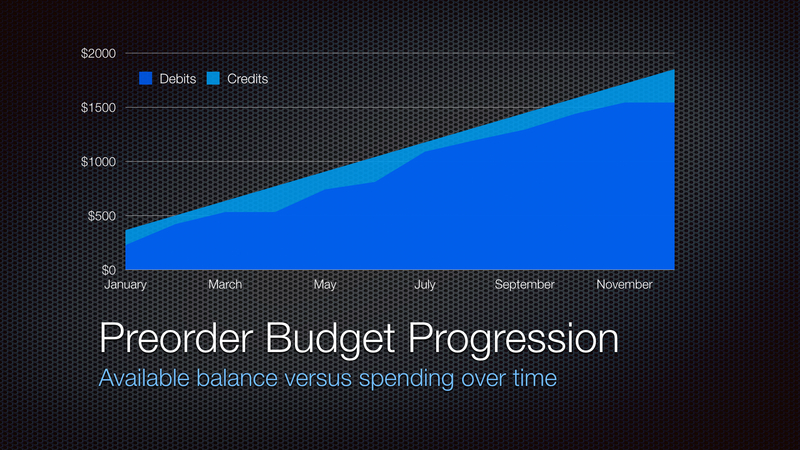 Now, let’s examine spending behavior from a few different angles and see if there are any interesting trends therein. Alter continues to hold the top spot by a good margin, though three of those seven purchases were older second-hand figures. MegaHouse had a particularly good year, with three purchases, for a company that has rarely grabbed my attention in the past. I feel like a number of new manufacturers have emerged in the past couple years and that’s reflected here with four new (to me) labels making an appearance: Alphamax, Dragon Toy, FREEing, and Wing. I can’t comment on FREEing as that order is still open, but the other three generally impressed with their work, which should bode well for diversity in this category going forward. AmiAmi continues to get the more of my business than any other retailer, which is mostly a function of pricing and availability, but their share has shrunk to just over a quarter of my total purchases. 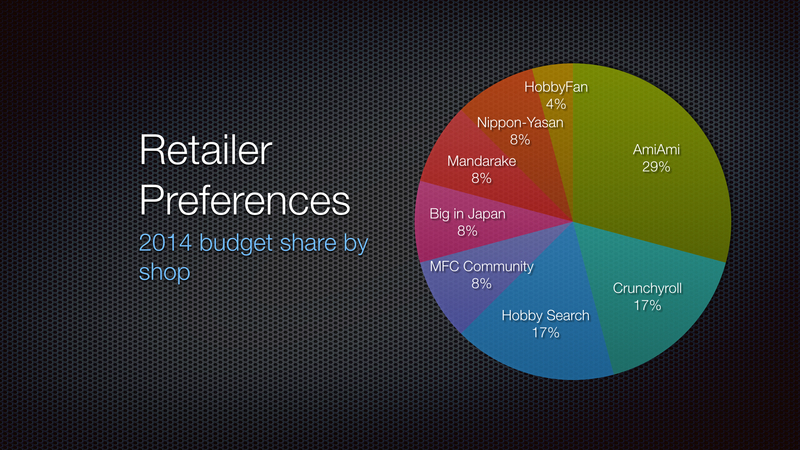 With my budget being structured the way it is, it’s quite common that I have to delay preorders to a point at which many shops have stopped taking orders (at least temporarily), and at that point I tend to choose whichever of the AmiAmi/Big in Japan/Hobby Search triumvirate has availability first. The emergence of Crunchyroll is somewhat interesting. I became a subscriber last year during their Black Friday promotion, which included premium access and a small store credit. I needed to use the credit, which started me looking at their figure selection. CR is a bit of an odd duck as a shop. Their daily deal pricing on figures tends to be quite good, particularly when combined with the standing $75+ free shipping code. Their regular pricing, on the other hand, is not very compelling and their selection seems to be limited to the lines that Good Smile Company distributes, Kotobukiya, and MegaHouse. Additionally, CR orders suffer from the usual 1-2 month delay for a domestic shop. 1/8 scale continues to represent about half of my purchases, which is a simple reflection of its position as the dominant size in the industry. 1/6 scale is sharply up from last year (5%), which is encouraging given that it’s my preferred size for figures. I considered a few 1/4 scale figures this year, but I have yet to pull the trigger on one. Remember that nice upward-trending exchange rate? Well, this is the counter-balance to that. 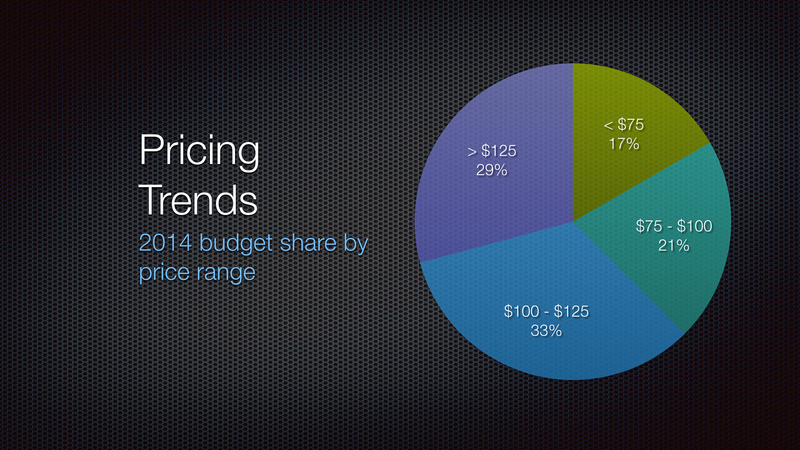 Pricing is up across the board, as I covered back in my early-year budget overview. The $100-$125 and $125+ ranges have grown significantly year over year at the expense of the $75-$100 range, which was previously the largest. Curiously, the sub-$75 range remained roughly one-fifth of all purchases, which I chiefly attribute to increased bargain bin activity compared to prior years. 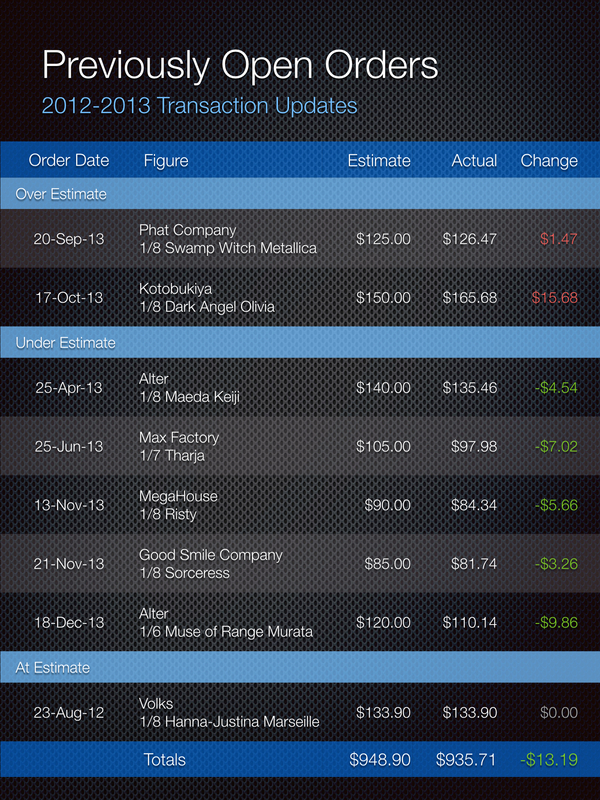 New for this year, I have aggregated some basic shipping service statistics based on my 2014 purchases. 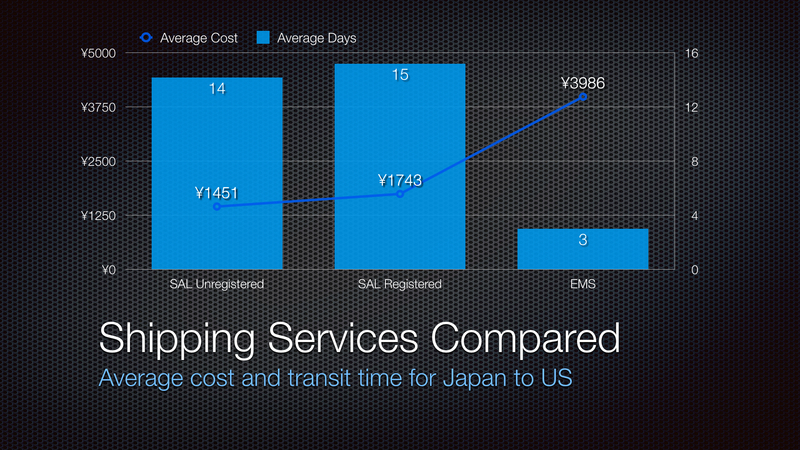 EMS is the fastest by far, but come with a significant cost premium. SAL Registered and Unregistered are basically identical for transit time as your additional ¥410 just pays for tracking and insurance. No surprises, but it’s still nice to see it in numbers to confirm what we already knew. I’ve retained the same basic budget strategy for several years with little more than a few numerical tweaks, so the results are fairly predictable at this point, which is good from the standpoint that things are working as intended, but I also worry that predictability makes posts like this feel more like a formality than a fresh, insightful piece. Looking ahead, exchange rates are in a good place right now and hopefully will stay that way. Pricing trends, on the other hand, are worrying. ¥10,000+ seems to be the new norm for scale figures of any complexity and I don’t see manufacturers backpedaling off of that level. For now, I can merely hope it doesn’t get any worse rather than earnestly expecting improvement.